Ants can be a huge nuisance, and nothing is worse when the warm weather finally comes, only to find out that you have a parade of ants always running through your kitchen. 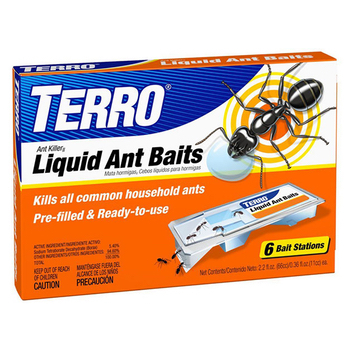 Consumer's Survey is always on the lookout for products that effectively get rid of all kinds of pests, and so when we found this TERRO Prefilled Ant Killer 2, we definitely wanted to give it a try. We also checked out several hundred reviews online from customers who had already tried these baits to see what others thought and so we knew what to expect when we used them ourselves. These ant baits are convenient and ready-to-use bait stations containing a formula that is fast acting. Instead of a gel like many other baits, this contains a liquid which is easier for the ants to carry and digest. It can kill all common household ants, and you don't have to worry about any sills, drops or mess. These bait stations can be used either indoors or outdoors. The patented design these baits have prevent you from having to handle any dangerous chemicals and stops the bait from drying out. All you have to do is place them near ant trails or where you see a lot of ants on a regular basis. Use all of the baits at once to make sure that there is a sufficient supply for the ants. Since this is a bait, you will see a lot more ants at first as they flock to the sweet liquid in the ant bait. The foraging worker consumes it and drops a pheromone train back to its nest so all the other workers can find the food supply. The poison works slowly so it has time for the worker to take it back to the rest of the colony and share it, including the queen. In this way, the foraging ants make several trips back and forth to the bait and bring back enough to feed to the entire colony. This is how you get rid of all the ants you can see, and all the ones you can't. Make sure you eliminate all other food sources so that the ants will only go to the bait. Also, resist the urge to interfere when you see the ants coming in to feast. If you have patience instead you will be rewarded as the ant infestation will dwindle and eventually disappear. You can replace any baits that are depleted if needed with additional ones, and once your problem is under control you can replace the stations every three months to stop the ants from coming back into your home. How well these TERRO Prefilled Ant Killer 2 baits worked is simply amazing. As many others, we had a great experience with these baits, as like was expected, they at first drew more ants than ever. We remained patient, kept the area totally cleaned up so they had no other food sources, and after a few days the ant parade suddenly started dwindling, then completely disappeared. No other baits we have used have ever worked this well, and with practically no mess (as long as you don't spill them). If you do, it is best to pour some boiling water wherever the liquid bait spilled, and then it wipes up easily.